GI Joe in alternate formats, like the Combat Heroes or even the 12” figures, usually doesn’t catch my interest. The Micro Force figures were an exception. An exception with a twisted arm. Several years ago a friend bought them for me for Christmas. He knew damned well that I’d get a kick out them and then “collect them all!”, by which I mean spending time and money finding them. If you’re not familiar, the Micro Force figures were rubbery mini-figures, statically sculpted in “deformed” proportions, measuring in at about one inch high. There was some sort of finger flick game kids were supposed to play with them. They were sold in blind packs and random blister packs. Most of the figures were of existing characters. But several figures were brand new characters, never seen in 1:18 scale before. Dark Ninja Brawler was one of them. The name is a tad confusing. Is he “Brawler”, of the Dark Ninja clan? Is this a “named” character? Or does the figure represent an army builder of Dark Ninja Brawlers? Six years after the figure was released, I doubt we’ll ever find out. 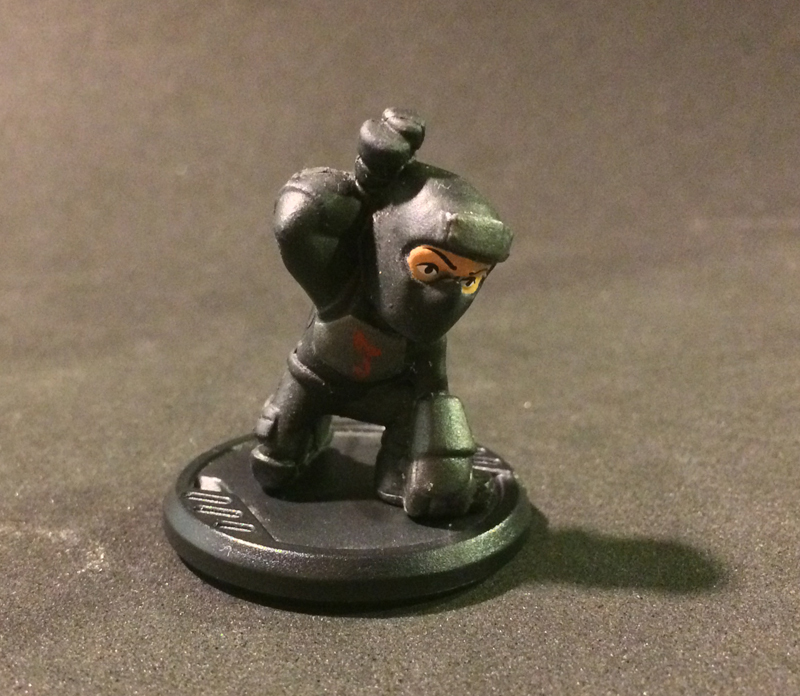 Unlike the other ninja figures in the line, DNB isn’t wearing a traditional gi. He’s wearing black workout attire. There’s probably a Nike or Reebok logo underneath the big cast iron plate on his chest. The matching gauntlets and knee pads are nice, but the forehead armor on his ski mask is spectacular. Who does that? Someone who likes to brawl, that’s who. I knew if I got one of these, the collecting bug would own me and it would be game over. So I avoided these. But the characters were still cool looking. Years later I found a steel brigade figure on the sidewalk. Somebody somewhere collected these lol. That steel forhead armor is a “Naruto anime” thing. Dunno if its factually accurate. Hell, does it even matter? most of GI JOE ninjas arent factually accurate lol. Well, poo. I may need some additional pics of this lil fella. He just might end up my next custom.